RSW- Artwork page, "Aeolus: Home of the Winds"
This chalk was discovered to precede another of the same name drawn in 1950 because of its mention as being exhibited at the Pynchon Galleries, 1929 "crayon" exhibition. We do not know if the content is the same as the 1950 drawing. See also the Landscapes & Views Gallery for related pieces. See also the Mountains Gallery for related pieces. Read the Scrapbook story for more about the Packard. Read the Scrapbook story about the Pynchon Gallery Exhibition, 1926 for more. "...the pastel works - they're just fantastic. And I'm afraid that they photograph very well but you don't really appreciate the difficulty of making them until you see them up close. That as you know with pastel, you have to be very very good to make it work, because it hard to correct a mistake. With oil paint it is much easier to cover over the error. But these are really really spectacular." "Clear, brilliant 'June Sky' day. Everything against it but decided to go to Manchester today with Mark to try to begin a chalk drawing for the coming exhibition. Mark packed the car with the chalk things (alone and forgetting nothing) and we started in the Packard about 10 over the trail to N. Adams. Stopped there for stationary errand. On through Bennington. Sandwich lunch with much trouble over my teeth. Quite a little this side of Arlington where Equinox, Aeolus, etc. first show plainly, suddenly decided to make my drawing. Finally got located in the middle of an open field and set up work about 12:30. Mark went across the field into the shade with his typewriter doing over my address book. I worked til 5 feeling I was making a good thing. Since through so early and so comparatively near home decided (in order to give Mark his evening with Barbara) to come right home and not go to Manchester or the Grandahls or go in to formal supper as planned. Tried to find a clean sandwich place from Bennington on even in N. A. but failed until we reached the first of the trail. From Mohawk Park over the back way by 8:15, the sun still up." AEOLUS: In Greek Mythology King of the Winds. 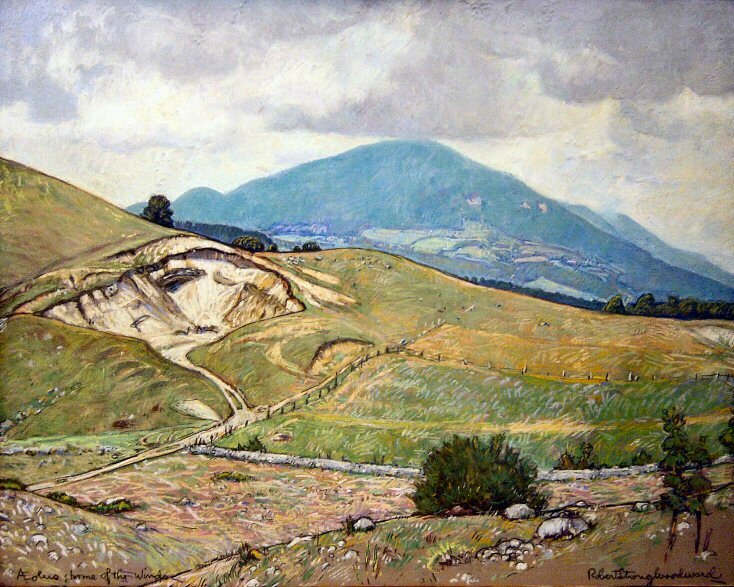 AEOLUS is also a mountain in Vermont and the subject of this work. Though this chalk drawing pre-dates it, it is worth noting that... Locally RSW was nearly as famous for his 1936 Parkard Phaeton V-8 as he was as an acclaimed artist. 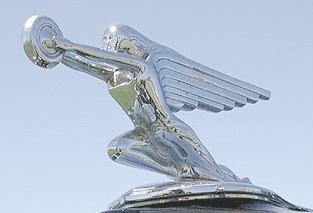 The hood ornament for the Phaeton was none other than AEOLUS himself. Please click on the following link to see Robert Strong Woodward's Packard Scrapbook Page with more photos and tidbits including the original manual! 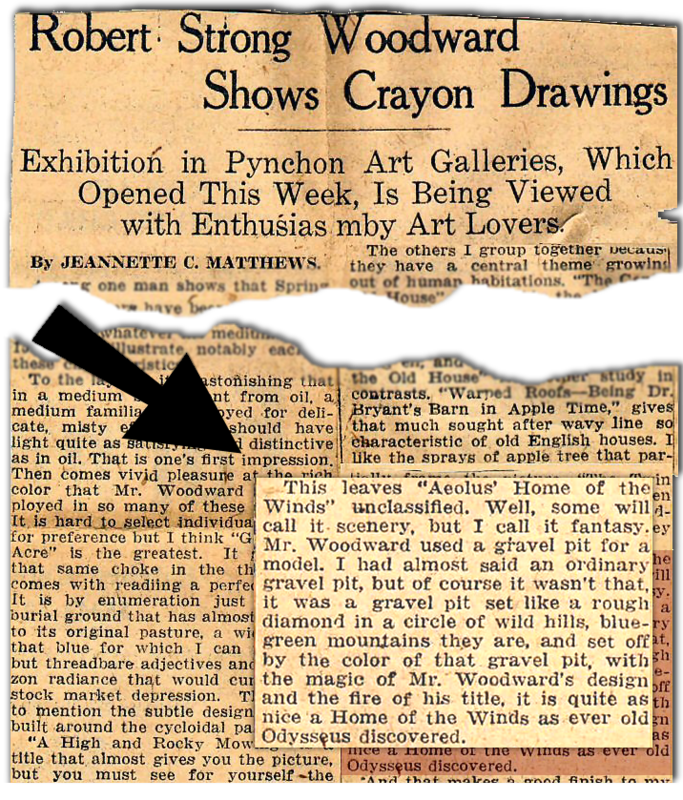 This chalk was discovered to precede another of the same name drawn in 1950 because of its mention as being exhibited at the Pynchon Galleries, 1929 "crayon" exhibition. We do not know if the content is the same contextually as the 1950 drawing, however, given the descriptions by reviewers of the exhibition(below) we can assume they have very similar qualities though, drawn 20 years apart. Oddly enough, RSW makes no mention of this earlier piece in his diary or to 'Mark' who accompanied him on his 1950 excursion. "....In Aeolus: Home of the Winds is seen a mountain of entrancing blue with a pasture in the foreground that would seem more like a trysting-place for fairy folk than an ordinary meadow for prosaic cows to roam. "Given by the estate of Harriet Newhall (former director of admissions at Mount Holyoke College---Class of 1914) to Mount Holyoke College Art Museum, South Hadley, Mass."